War refugees from Syria and Iraq trapped in northern Greece for weeks never held out much hope that meetings between EU and Turkish leaders Thursday would prompt an opening of Balkan borders for them. But with nothing definitive about their future coming out of reportedly tense Brussels negotiations, refugees are now scrambling to enter an EU relocation program they were rejecting just days ago. Their biggest fear is being returned to Turkey, if a deal is finalized between Turkish and European leaders, or languishing for years in Greek refugee camps, the more likely outcome say refugee rights campaigners. In theory the relocation plan should guarantee them placement in an EU country, but it has worked agonizingly slowly since it was introduced last year with less than a thousand refugees resettled. Sitting in front of a small tent at a platform-end of the railway station at Idomeni, Ramia Sabbagh, a 19-year-old visual arts graduate from the University of Aleppo, said she, her mother and two siblings were thinking of heading back to Athens to apply for relocation, despite the drawback they wouldn’t be able to pick which country they would eventually be re-settled in by authorities. “We have to get to Norway,” she says. Ramia’s 10-year-old brother and her father are now in Norway, after having set off before the rest of the family months ago. “We couldn’t go with them because we didn’t have enough money to pay for the journey and for the smugglers for all of us,” she explains. Ramia, her 48-year-old mother, 16-year-old brother and eight-year-old sister have been at Idomeni for a month. “It is our our anniversary today,” she grimaces. They left Aleppo two-and-half months ago because of Russian airstrikes and the al-Qaida affiliate Jabhat al-Nusra fighters who started to flood their neighborhood. “We were very scared of them,” she says. “We decided it was time to leave,” she adds. Like many others who have decided the best course now is to apply for EU relocation, Ramia and her family have had push-back from U.N. refugee staff at Idomeni and have been unable to enter the process. According to the U.N. refugee agency spokesman Babar Baloch, Greek authorities can’t cope with the demand. And staff other EU countries promised to dispatch to Greece to assist never materialized. Greek asylum authorities are staffed at a third of the capacity EU officials judge it needs, and according to U.N. sources there are only 20 staff working on the relocation process in Athens. 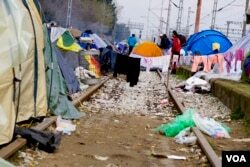 Instead of people applying through the United Nations, they are now being urged to contact Greek immigration authorities directly by Skype, not the easiest method for refugees who have little access to the Internet at Idomeni and are hard-pressed to recharge their cell phones. Getting into a position to apply is just one of the drawbacks of the EU relocation plan, notes Lucy Carrigan, regional officer with the International Rescue Committee, who have deployed 40 staff at Idomeni to help French charity Médecins Sans Frontières/Doctors Without Borders (MSF), which has been the lead NGO for weeks at the makeshift, informal camp. Only 937 war refugees from Syria and Iraq have been relocated under the EU plan introduced last year. It was to resettle 160,000 refugees in Europe, with beneficiaries being shared between EU countries. Opposition from some member states, including Britain and central European and Balkan countries, sabotaged the plan from the start. EU Commission efforts for a “radical overhaul” of the relocation process with asylum applications being handled by a new federal agency met resistance Thursday in Brussels, say EU officials. Central European and Balkan officials told VOA weeks ago they would reject the commission’s plan. And officials from other countries also expressed anxiety Thursday, fearing the plan risks expanding into an open-ended commitment, a commission official in Brussels says. For many refugees the EU plan is unappealing because they fear they will not get to be reunited with family members already in Europe. They are also distrustful of Western promises, as a result of Europe’s shifting positions when it comes to accepting refugees. But the attitude now appears to be that they have no choice, even if it means months being caught in bureaucracy for it is better than giving up hope.